The new Contoso in the Microsoft Cloud poster shows how the Contoso Corporation, a fictional but representative global organization, is embracing a cloud-inclusive IT infrastructure that includes all of Microsoft’s cloud offerings (Microsoft Azure, Office 365, Dynamics 365, and Microsoft Intune). An overview of the fictional Contoso Corporation, its three-tier design for its offices, and key elements of Contoso’s implementation of the Microsoft cloud. A review of Contoso’s on-premises IT infrastructure and how its business needs map to Microsoft’s cloud offerings, including opportunities for Azure PaaS and IaaS. Contoso’s private WAN infrastructure, its app design for its offices, its use of Azure ExpressRoute Premium, and its step-by-step path to cloud networking readiness. Contoso’s on-premises Windows Server Active Directory (AD) forest, how it geographically distributes authentication traffic, and how it uses Azure IaaS to provide authentication infrastructure redundancy for the 15,000 workers in its Paris headquarters. Contoso’s structure for Microsoft cloud offering subscriptions, licenses, its common Azure AD tenant, and user accounts synched with Azure AD from its on-premises Windows Server AD forest. Contoso’s security requirements in the cloud, its data sensitivity classification and mapping of cloud features to each level, and its step-by-step path to cloud security readiness. Download this multi-page poster in PDF or Visio format, or see it online on Docs.com. You can easily print the 9 pages of this poster on tabloid format paper (also known as 11x17, ledger, or A3 format). Future additions to this poster will include end-to-end configurations of key cloud scenarios, such as an Azure PaaS app that replaces their current document access system and SQL Server Stretch Database for their historical transaction data. Stay tuned for the updates as we evolve the Contoso Corporation from an on-premises IT infrastructure to a cloud-enabled and agile IT infrastructure. If there is a scenario you would like to see in a future update to this poster, send a quick email to CloudAdopt@microsoft.com. 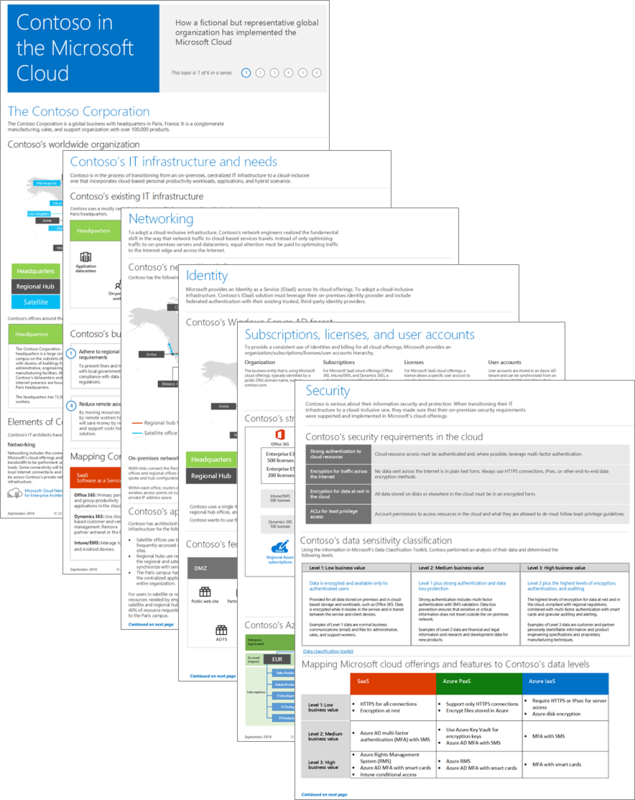 Here are the additional posters in the Microsoft Cloud for Enterprise Architects Series.